Thorny issues such as gas pricing and transit and the on-going fighting in the southeastern Ukraine come in the way of normal diplomatic ties between the neighbours. Tensions between Russia and Ukraine are not abating. After the talks between Gazprom and Naftogaz collapsed, Kiev has proposed handing over 49 percent of the country's gas transportation network to European and American companies to ensure gas transit into the EU and hinder Russia's plans for the construction of the South Stream gas pipeline. Cooperation between the “brotherly” states has been further undermined by recent clashes between the Ukrainian National Guard and armed militiamen not far from the Russian border, in which several mortar shells exploded on Russian territory. Recent talks between Gazprom and Naftogaz ended in a stalemate, and having been left without Russian gas, Kiev is now trying to restrict its neighbour's plans to construct the South Stream pipeline that will be bypassing Ukrainian territory. To that end, Kiev proposes handing over 49 percent of the country's gas transportation system to European and U.S. companies. However, Russian experts maintain that this proposal is unlikely to make Europe less interested in South Stream, as European consumers are primarily concerned about the reliability and stability of gas supplies. “Investors join a project when they are ensured of payback. This project can work only if there is transit gas in place. And transit gas can be guaranteed only by Gazprom. Whereas Gazprom does not want to guarantee it because it believes that transit through Ukraine is associated with big risks,” says deputy head of the National Energy Security Fund Aleksey Grivach. “This project can be implemented only if Europe says a categorical no to South Stream. That would be the only way to put pressure on Gazprom,” he adds. This is what Ukraine's policy of the past several months has been aimed at, Grivach is convinced. “Generally speaking, for Europe, the South Stream pipeline is superfluous, but European countries are so much concerned about energy security that they have always agreed to the construction of additional infrastructure,” says Greenwich Capital partner Lev Snykov. “Even control over Ukraine's gas transportation system will not cancel interest in South Stream,” he adds. Fighting in southeastern Ukraine has now approached the Russian border. Several Ukrainian and Russian border guards were wounded in clashes between the Ukrainian National Guard and separatist militia. Also, several buildings and engineering facilities of the Novoshakhtinsk border checkpoint were damaged. “Despite the Ukrainian president's announcement of a ceasefire, fighting in the country's southeast continues. The incident on the border clearly shows that the new authorities do not fully control the situation and that Kiev combat units are not subordinated to them,” independent military expert Viktor Litovkin says. Since the start of the military operation in southeastern Ukraine, there has been a sharp increase in the number of people fleeing Ukrainian territory for Russia. Late last week, the head of the Russian Federal Migration Service, Konstantin Romodanovsky, said that every day thousands of Ukrainian nationals enter Rostov Region alone, some of whom settle down there, while others proceed to other parts of the country. 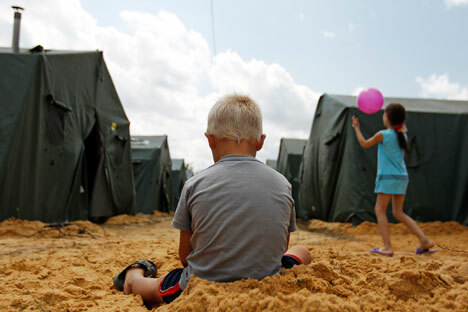 The Russian Emergencies Ministry's official spokesman Aleksandr Drobyshevsky has announced that nearly 220 temporary shelters, including tent camps, have been set up in southern and central Russia to accommodate people arriving from Ukraine. “There are currently 11,100 people, including 5,400 children accommodated at temporary shelters,” he said. A European law expert at the Moscow State Institute of International Relations, Nikolay Toporin, explains that refugees, if they decide to remain in Russia, can get Russian citizenship within three months. In the meantime and while their applications are being considered, people can find jobs through mobile employment services deployed in the border areas. “Refugees can quickly find jobs in catering, as cooks and kitchen staff. There are also vacancies in the construction sector. Pay for these jobs for Ukrainian nationals will be the same as for locals, at about 40,000 roubles,” an employment service official, Zhanna Deniskina, said. The head of the Russian presidential administration, Sergey Ivanov, has promised that refugees from Ukraine who have decided to remain in Russia may soon be provided with targeted financial assistance. They will receive funds from the federal program for compatriots' resettlement, which will now cover Rostov Region and Stavropol Territory too.